A new documentary drama about a woman’s search for the possible origins of the appaloosa horse breed is hitting the big screen later this year. The film True Appaloosa is the result of a chance viewing of a Conor Woodman documentary about travelling in Kyrgyzstan by New Zealand foundation appaloosa breeder Scott Engstrom. New Zealand foundation appaloosa breeder Scott Engstrom travelled to Kyrgyzstan seeking spotted horses. US born Engstrom, who has lived at the top of New Zealand’s South Island since the mid 1990s, saw a horse in the documentary (Around the World in 80 Trades) that Woodman had traded during his journey. She thought the horse looked a lot like the appaloosas on her farm. The spotted appaloosa has been recognised as a breed since about the mid 1940s, after a group of breeders got together to form the first stud book, based on horses who were originally selectively bred by the Nez Perce tribe. But in recent years, cross-breeding has eroded many of the bloodlines and the original type of the breed. There are only a handful of breeders world-wide who work to maintain the old bloodlines dating back to the early 1900s, avoiding crossing the horses with other breeds such as the quarter horse, which is common in the US. It is not know how many true foundation appaloosa horses remain today, but there are estimated to be fewer than 200. Engstrom has been breeding foundation appaloosa horses since the mid 90s, and has built up a sizeable herd. Three of Scott Engstrom’s foundation appaloosa horses. After seeing the 80 Trades show, Engstrom contacted Woodman, the show’s presenter, and from their discussions about the origin of the breed, the film was born. Engstrom, at the age of 69, packed her bags to join Woodman and a film crew in Kyrgyzstan to find the horses and see if there were any more. Woodman said: “Scott and I exchanged quite a few emails about the Appaloosas and I also started to talk with my friend Munarbek Kuldanbaev, who had initially helped me buy horses when I made the 80 Trades show. Eventually we all started to get excited that we might be onto something. For Engstrom, it was the adventure of a lifetime. “I would do it again in a heartbeat!” she says. “The first time I saw that first herd coming over the hill, I cried like a baby… such tears of joy! I will never forget it ever. It was almost surreal and what a blessing to know that this special breed still exists in the wild and it tells you they are survivalists. “The Kyrgyzstan men are wonderful horsemen, having been raised since early childhood on horses. It was such a pleasure to watch them handle the horses and not a mean thing was done with even the most wild. “One of my biggest thrills was being called into the makeshift enclosure by the head stallion to say hello. Yes, he was wild as. He had placed all of his mares and foals (about 20) behind him and then looked at me and started to chomp like a foal would do,” she said. 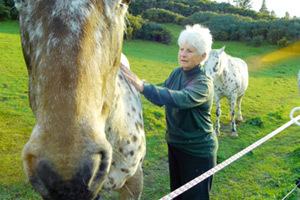 Engstrom has used only foundation lines on her appaloosa stud farm. Woodman says as the action was being filmed, he didn’t know how it was going to end. “I wanted to stay true to the spirit of adventure and the journey into the unknown. He says the film had changed his life. True Appaloosa will be showing at various film festivals around the world later this year and in 2015. The movie True Appaloosa – Quest for the Secret Horse can be bought or rented online. Scott Engstrom and director Conor Woodman on the trail of spotted horses in Kyrgyzstan. I just watched the programme on finding the true Appaloosa which I found delightful. It brought tear to my eye. Seven years ago I got my first introduction to this breed, when I acquired a young crossbred filly. Her pedigree is quite a combination, sire and appaloosa Thoroughbred cross and dam an Irish Sport. She is a big girl, standing at 16.2hh but the appaloosa characteristics are all very strong, the coat, eye, spotted skin, thin forelock, striped feet, fantastic well squared conformation. Quite a strong ‘personality’ insisting on being included in all decisions. One aspect that I felt you programme may have helped me to understand is that I found she is very intolerant of sugar rich foods and grazing, exhibiting excessive glycogen/ polysaccharide storage. Diet management has been a real challenge in dairy pasture Cheshire. Seeing the origins of this horse in the sparse mountain regions of Kyrgyzstan and hearing the nomadic breeder speak of the legend of their history and hardiness has helped put the final piece in to the jigsaw of an understanding of my girl. I do not know whether other Appaloosa owners have experience of this issue. Literature indicates it is a fairly prevalent condition in this ( and a number of other, mainly American lines ). Loved the programme, what a fantastic experience. I just found this site by chance & what a pleasure!! I can not wait to see this movie!!! Hope I can find it to buy…. I was very interested in what You said about Your Mare’s diet! I have a 14 yr. old 90% foundation bred mare and She has developed the “thick Neck” , (often) a sign of excessive glycogen. Can You tell me do You use a supplement with Her hay for this? I am interested in Your program?? We saw your documentary last spring at our Sun Valley, Idaho film festival and cried along with you! What a thrill after all you false starts to come across this herd of true Appaloosa horses in the wilds of Kyrgyzstan. My husband and I and a few fellow hiking friends are coming to New Zealand in April 2016. After our Milford Trek, we would truly love to come visit your ranch and meet you in person. I will email you and hope this will be possible. What a wonderful movie, a real documentary movie,so very interesting . I have loved Horses all my life and I too cried tears of joy at finding the true wild Appaloosa horses in that valley. You were right all along, you knew in your gut you were right.